This is Stoney St Clair’s third and final stage of tattooing. He started out doing the classic tattoo imagery, progressing along to a transitional drawing style like this cover up image seen below. His style evolved into a wild, totally unique style of tattoo art wholly his own. The Body Electric exhibition features vintage tattoo flash of the late 19th to early 20th century and original art by the most influential tattooists today. Opening reception Sept 18, 6-8pm. 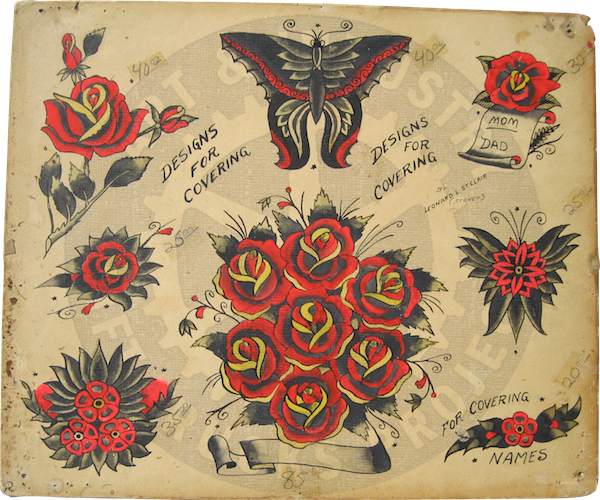 Vintage tattoo flash on exhibit from Lift Trucks Project. Stoney St. Clair: Leonard L. St. Clair (1912-1980), nicknamed “Stoney,” was a circus performer and tattoo artist born in West Virginia. As a child, Stoney was crippled by rheumatic fever and confined to a wheelchair. His father, a coal miner, used up the family savings, eventually even losing the family’s home, to keep Stoney at Johns Hopkins Hospital in Baltimore. In the hospital, Stoney drew incessantly. He found his calling in the circus, and one day when the circus was in Norfolk, VA, some of his circus colleagues took him to a tattoo parlor. Stoney refused to get a tattoo, but when he saw the tattoo artist at work, he was convinced he could do the same thing, and better. Over the next several days, Stoney befriended the artist and watched him work. When the circus left town, the artist gave him some tattoo equipment and Stoney set up shop behind the elephant barn. The circus wintered in Tampa, FL and St. Clair eventually settled in the city, opening a tattoo parlor where he was a fixture for decades, and many older residents still bear his work. He then moved to New Orleans and eventually Columbus OH, where he passed away. 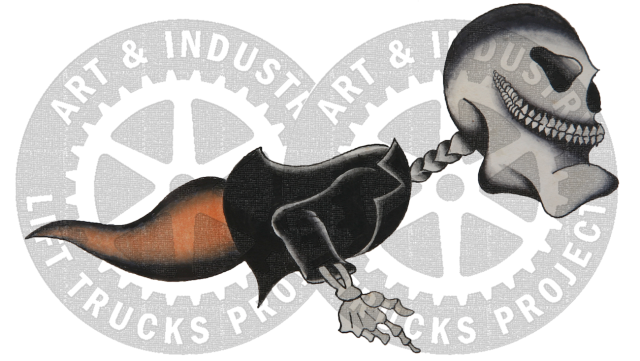 This entry was posted in Uncategorized and tagged Body Electric, Lift Trucks Project, Margot Mifflin, Ricco Maresca, Stoney St. Clair, Stoney Tattoo, Tattoo Flash, Tattoo History. Bookmark the permalink.